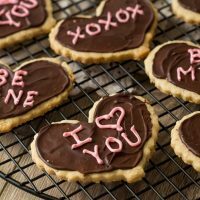 Valentine’s Day heart shaped shortbread cookies are fun to make this time of year and share with friends and family. So enough with the salads and healthy desserts in January. (I’m sure everyone’s eating resolution’s are over for the year). I’ve have a slew of rich chocolate desserts and Valentine’s day treats coming your way the next few weeks. Starting with these Valentine’s Heart Shortbread Cookies. My family has been making a version of these based on this Taste of Home recipe since we were little. It’s a little different than traditional shortbread because it includes oatmeal, but I love the texture it gives these cookies. This is a very basic shortbread recipe with the addition of quick cooking oats. Simply cream the butter and sugar together and stir in the remaining ingredients. The recipe includes both vanilla and almond extract, but feel free to leave the almond out if it isn’t your thing. Roll the cookies out on a well floured surface. If the dough seems a bit sticky, chill it in the refrigerator for 30-60 minutes. The stickiness of the dough depends a lot on the temperature of the butter, so chilling it will firm the dough up quite a bit. I’ve seen some versions of shortbread hearts that are dipped in chocolate. I simply placed chocolate chips on the cookies right after the come out of the oven and wait for them to melt. When they are melted, I spread it around with a knife or offset spatula. Ta da! Easy peasy chocolate frosting that doesn’t require another bowl. 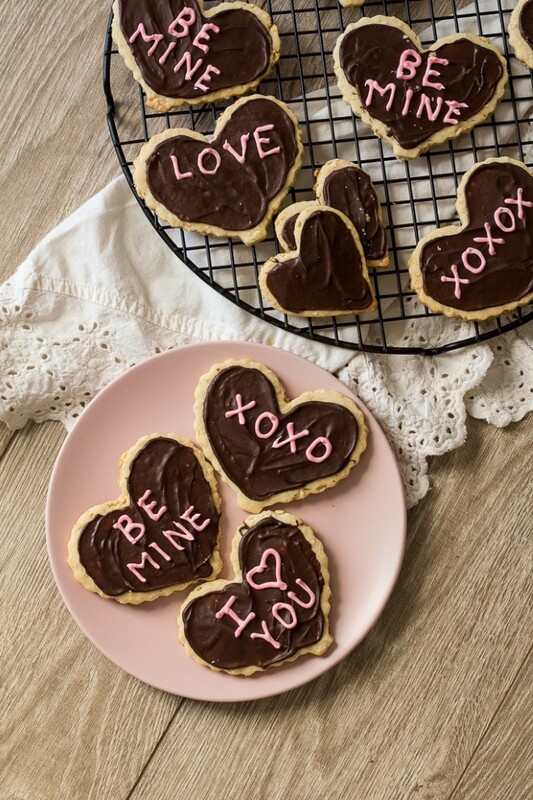 Piping cute words or sayings on the cookies is optional, but this time of year it’s fun to spend a little extra time in the kitchen. I used a very basic royal icing. This tutorial from House of Nash Eats on using royal icing on cookies is great. Go with the thicker piping frosting for the words on these cookies. It’s not as scary as it seems. 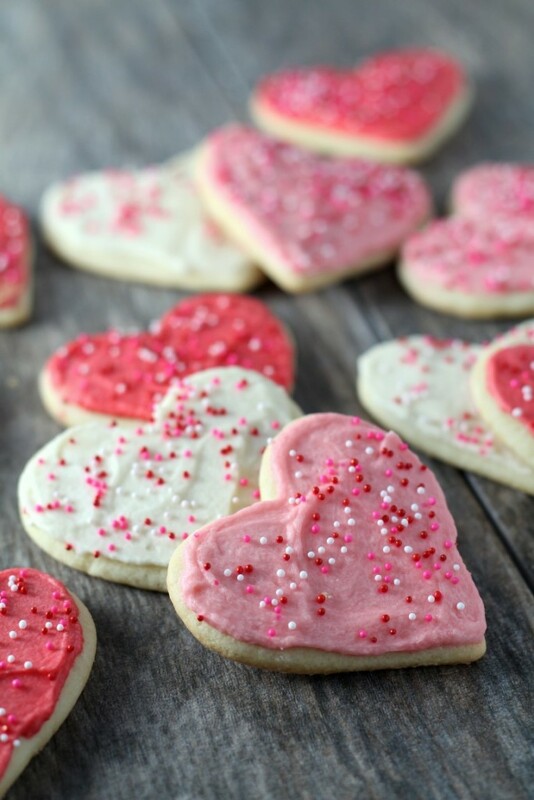 These Valentine’s heart cookies store well tightly covered on the counter for several days. If you want to make them farther in advance, they freeze well. Simply place the cookies in a tightly covered container and freeze for several weeks. They would also freeze well unfrosted if you want to make the cookies ahead of time and then decorate at a Valentine’s day party. These Red Velvet Cake Mix Cookies take just 3 ingredients and a few minutes to throw together, plus they look so cute. Find a pink plate to serve them on for extra Valentine’s flair. Caramel Stuffed Double Chocolate Cookies are a chocolate lover’s dream. Share a dozen with you Valentine for a fun, homemade gift. I’ve also made heart shaped cookies out of this Sour Cream Cut-out Cookie recipe and frosted them with a variety of shades of pink frosting for an ombre effect. You could also use a pink buttercream on these shortbread cookies if you wanted. 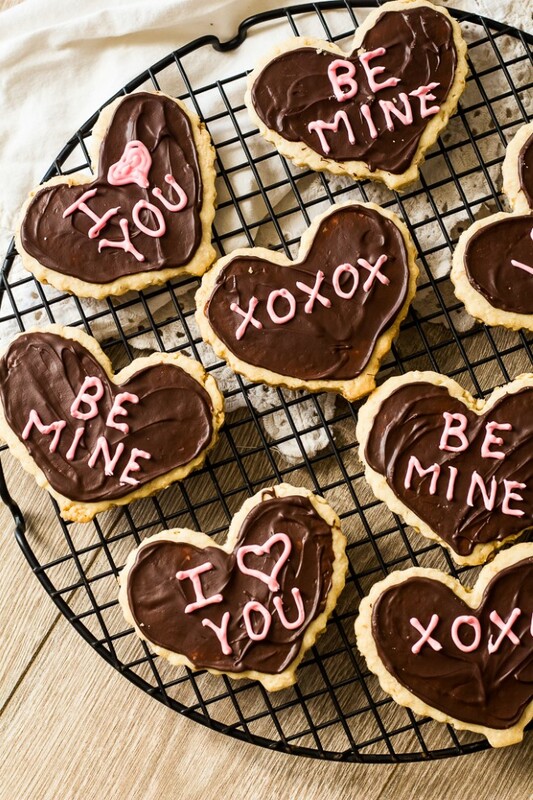 Let me know if you make these cookies for Valentine’s Day. 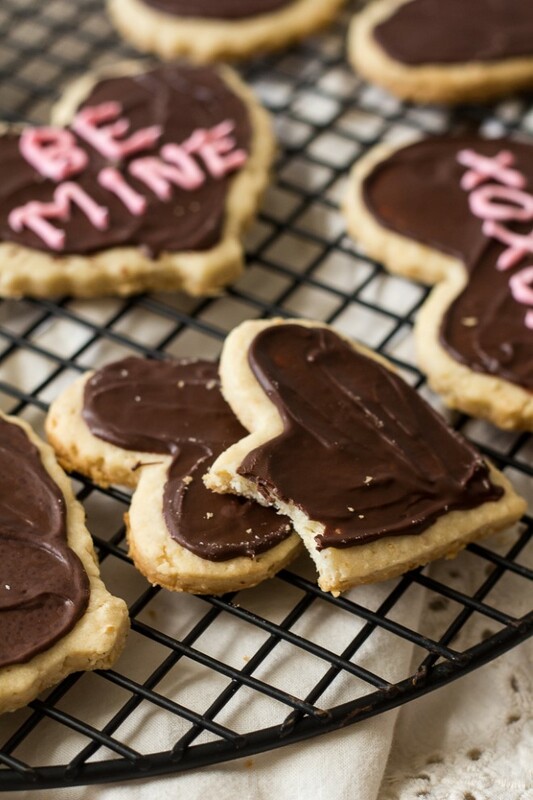 If you have any traditional Valentine’s day cookies or desserts, I’d love to hear about them in the comments. 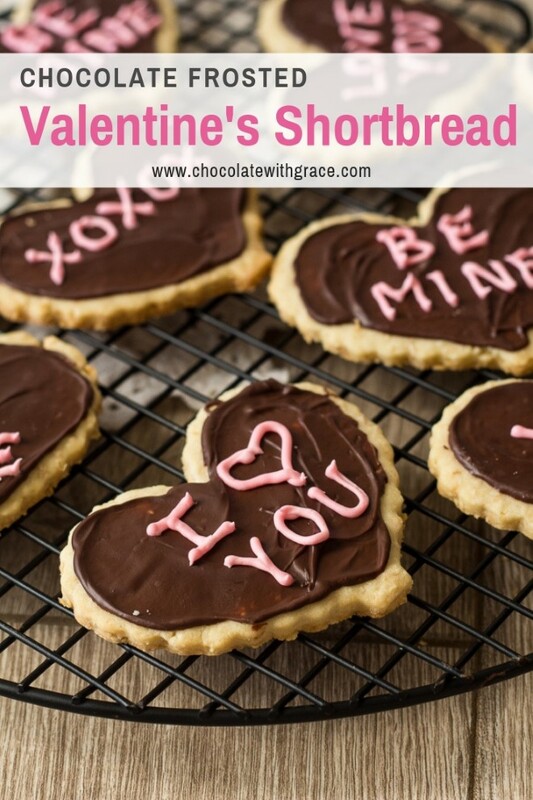 Valentine's Day heart shaped shortbread cookies are fun to make this time of year and share with friends and family. In a large bowl, cream together the butter and sugar until smooth and fluffy. Beat in the vanilla and almond extract. Stir in the oats, flour and salt and mix until well combined. Roll out the dough to 1/4 inch thickness on a well floured surface. If the dough seems a bit sticky, refrigerate it for 30-60 minutes or until it firms up. How soft the butter is plays a huge role in how sticky the dough is. 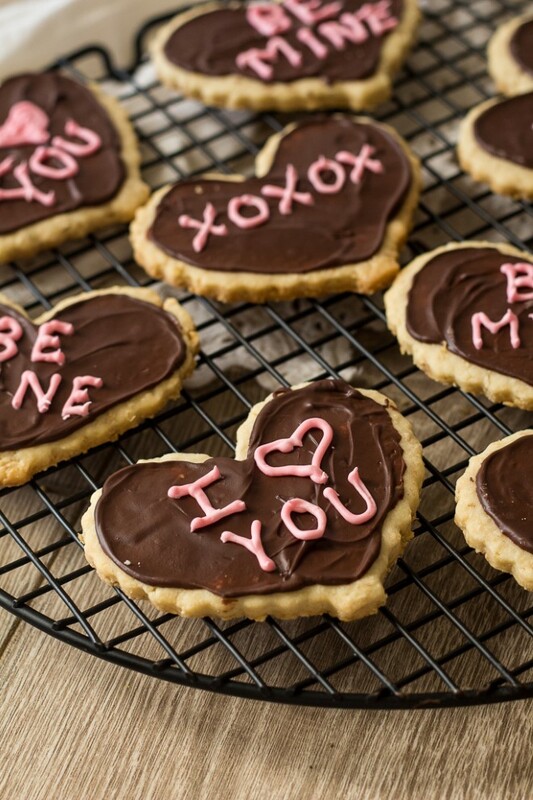 Cut the cookies with a heart-shaped cookie cutter and place on ungreased baking sheets. Bake at 350° F for 12-15 minutes or until lightly browned. As soon as the cookies come out of the oven, sprinkle 6-8 chocolate chips on top. Let them melt and then spread with and offset spatula or knife. Let cool completely on wire racks. Use royal icing to pipe conversation heart saying onto the cookies if desired. Store tightly covered. These cookies freeze well for several weeks. The oats must be quick cooking. If you only have old fashioned rolled oats, you can pulse them a few times in the blender to chop them up and use, but using rolled oats are too big to easily make cutout cookies. What a great recipe! I love any cookie that has a hint of almond! And, what makes it even better, is the chocolate! Perfect for Valentine’s! a perfect cookie recipe for any holiday! I love the addition of almond extract! These cookies are so fun. And will put a smile on anyone’s face. These are adorable. I’m making these with my kids for Valentine’s Day!